The Ferrari 250 GTO model was the ultimate development of the company’s 250 GT series in competition form, whilst still being useable as a road car, so it was still able to be driven to the track, raced and driven home. It made its public debut at the annual pre-season Ferrari press conference in January 1962, and made its competition debut in the Sebring 12 Hour Race, driven by Phil Hill and Olivier Gendebien, where it finished 2nd overall to a Ferrari 250 Testa Rossa sports racing car, and won the GT category in the process. The 250 GTO had a 2400mm wheelbase chassis, with factory type reference 539/62 Comp., and then 539/64 Comp, featuring four wheel disc brakes, independent front suspension, a rigid rear axle with Watts links, and was available in both left and right hand drive forms. The shape of the Scaglietti designed and built aluminium bodies, refined from an original Giotto Bizzarrini design, remained virtually unchanged during the production period from 1962 to 1964, apart from a one-off example bodied in the style of the 330 LM berlinetta, and the last three cars in the series, which received Pininfarina designed and Scaglietti built bodies similar to those which featured on the mid-engine 250 LM sports racing car. Four of the original ’62 style cars were also re-bodied in this style during 1964. The differences between the individual cars were mainly around the nose. The early cars in the series had a small elliptical radiator opening, bounded by rectangular driving lights, initially with brake cooling ducts under the nose, which then changed to vertical brake cooling slots in the nose alongside the driving lights, with the sidelights mounted below the Plexiglass shrouded headlights. The rear spoiler was bolted to the tail panel, and there were cabin exhaust air slots in the sail panel. The brake cooling ducts then had a circular configuration, and the side lights moved to a semi recessed location in the wing sides. The tail spoiler was initially bolted to the tail panel, but then became a riveted part of the body profile. All of the ’62 body style cars, had three removable "D" shaped panels on the upper face of the nose, the pattern being repeated with three openings in the underside of the nose panel. The '64 bodied cars and re-bodies, similarly have detail differences, but these are mostly relative to the roof shape, which was either long, short with integral spoiler, or short without spoiler, whilst the bonnet had either had a long slim tapered bulge running into the nose panel, or a projecting cold air intake. The power unit was basically a 250 Testa Rossa specification version of the Colombo single overhead camshaft per bank 3 litre V12 engine, with bore and stroke of 73mm x 58.8mm, but using dry sump lubrication, with factory type references 168 Comp/62, featuring a bank of six twin choke Weber 38 DCN carburettors fitted with ram pipes, to produce a claimed 300 bhp. The engine was coupled to a new five speed all synchromesh gearbox, with an open gate gear change tower in the cockpit. As on the preceding 250 GTs a wide range of rear axle ratios were available. The GTO berlinettas continued the run of competition success of the preceding "passo lungo" and "passo corto" models, and with the manufacturers championship being transferred to the GT category from 1962, gave Ferrari a hat trick of championship victories from 1962-64. Amongst their multitude of successes were high profile wins in the Tour de France in 1963 and 1964, GT class wins in the Targa Florio in 1962, 1963, and 1964, victories in the Tourist Trophy at Goodwood in 1962 and 1963, with GT category wins at Le Mans in 1962 and 1963, and in the Nurburgring 1000km in 1963 and 1964. The 250 GTO was the ultimate expression of the Ferrari 3 litre GT car, and with only a relatively short and small production run of thirty six (in including the 3 original '64 style bodied GTO's) examples, with an outstanding racing pedigree, it has become one of the icons in the company's production history, which has once again placed it in GT pole position, but this time in car collector’s circles. 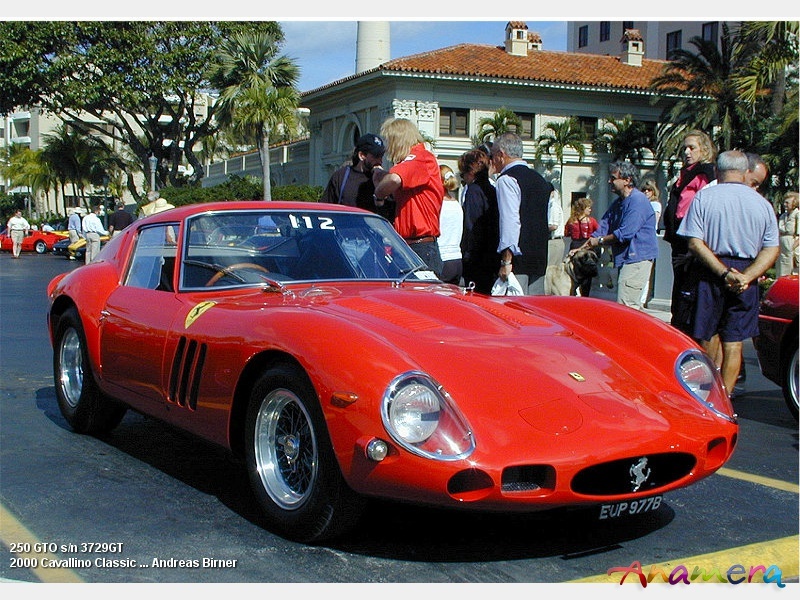 The Ferrari 250 GTO expresses the Ferrari philosophy the best, the highest performance and the slickest design. 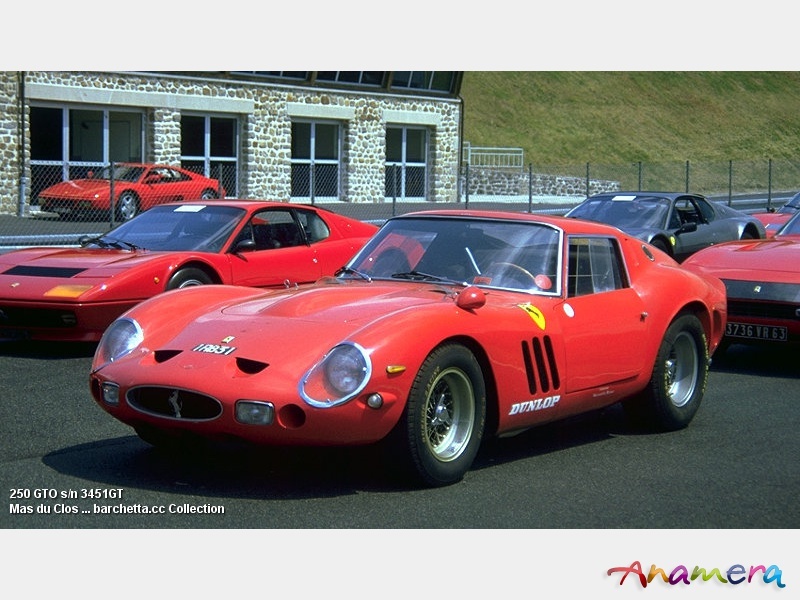 The production period of the Ferrari 250 GTO started in 1961 and ended in September 1963, in that time frame 33 GTOs were built (plus 3 with '64 style body work, 5571GT, 5573GT and 5575GT) . 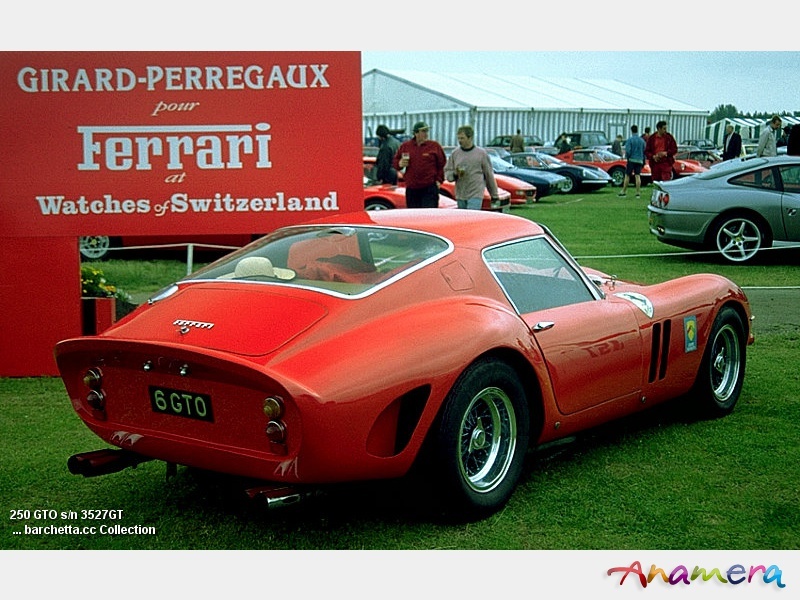 The design was by a team lead by Giotto Bizzarini, it's prototype was 2643GT based an a SWB Chassis. It does not only look stunning it also achieved uncountable racing victories. 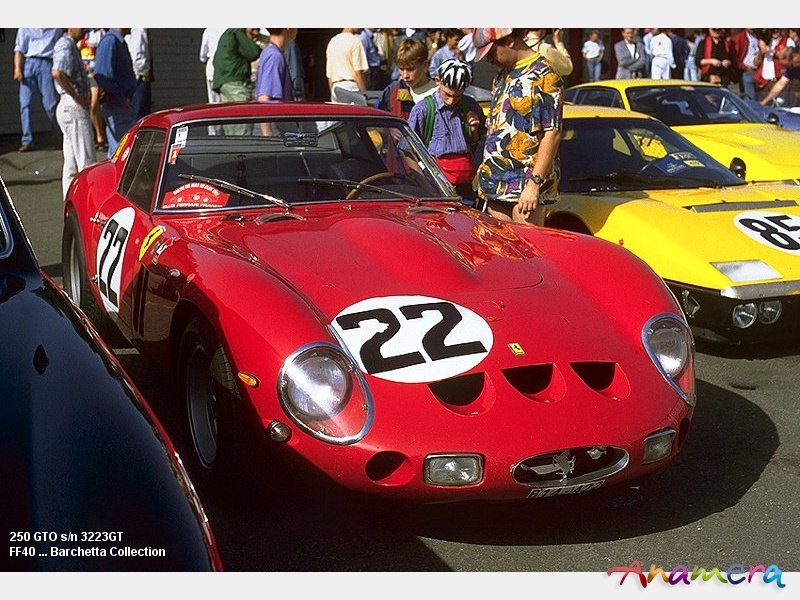 3223GT was the first Ferrari 250 GTO, it was used by the Scuderia Ferrari and test driven by Willy Mairesse in December 1961, it was completed in early 1962 and delivered to Luigi Chinetti Motors, NY, NY on July 19th. It was delivered to Bob KcKelvy's Scuderia Bear. In 1962 it was raced in Bridgehampton Double 400 (3rd OA, 2nd IC) by Ed Hugus and Charles Hayes, 5 Lap Tourist Trophy(3rd OA, 3rd IC) by Lorenzo Bandini, 25 Lap Tourist Trophy (2nd OA, 2nd IC) by Charles Hayes and Lorenzo Bandini, 5 Lap Governor's Trophy (5th OA, 1st IC) by Lorenzo Bandini, 17 Lap Governor's Trophy (3rd OA, 1st IC) by Charles Hayes, Nassau Trophy (5th OA, 1st IC) by Charles Hayes. In 1963 Hayes and Thiem finished the 12h Sebring race 18th OA and 6th IC. Next was the Continental Cup Daytona (4th OA) with George Roberts jr. in the drivers seat, he was joined in the 3h Daytona Continental by John Cannon and finished 15th OA. Charlie Hayes, Gene Hobbs and Alan Patterson drove 3223GT in Marlboro 6h and finished 7th OA. In September 1963 Bob Grossman of Nyack, NY bought 3223GT, it was raced by him and Charlie Hayes in the Bridgehampton Double 500 finishing 10th OA and on the 15th they finished 3rd OA, 14 days later Grossman finished 14th OA in the Canadian GP in Mosport. In 1964 Larry Perkins became the new owner, he raced with William Eve in 1964 and Slottag in 1966. After a trip around the world the car lives today (2006) in Pennsylvania. 3387GT was in march test driven in Monza, and in the same month delivered to Chinetti Motors and entered in the 12h Sebring race, Phil Hill and Olivier Gendebien finished 2nd OA and 1st IC, the GTO was sold to Bob Grossman. Grossman and George Roberts jr. finished 6th OA and 3rd IC in the 24h Le Mans race. Grossman raced the Bridgehampton Double 400 (2nd OA, 1st IC), Watkins Glen GT race (7th OA, 3rd IC), 5 Lap Tourist Trophy (4th OA, 4th IC), 25 Lap Tourist Trophy (4th OA, 4th IC), 17 Lap Governor's Trophy (dnf), Nassau Trophy (6th OA, 2nd IC), 12h Sebring (18th OA, 6th IC) Charlie Hayes and Douglas Thiem joined Grossman in Sebring. 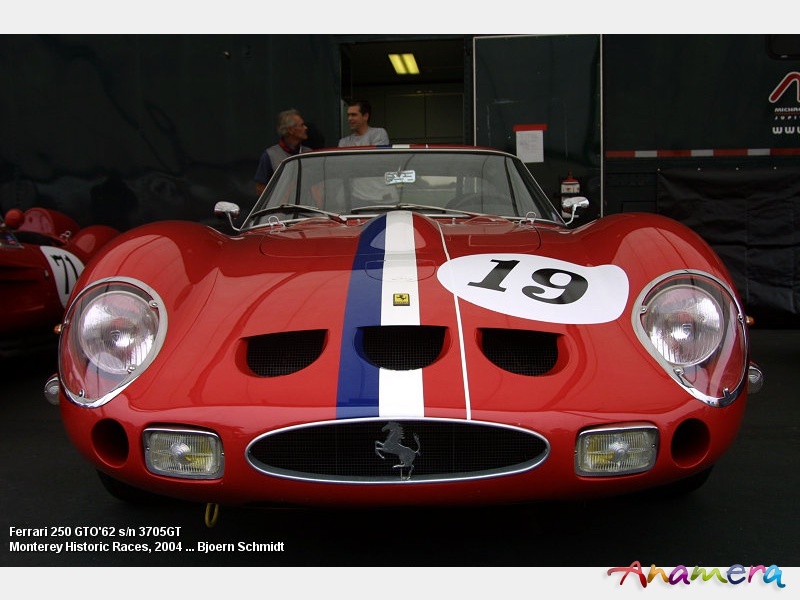 Geraldi & Mike Gammino became the new owners in May 1963 and Mike raced the 250 GTO until November 1965. 3413GT started live with '62 style 250 GTO body and was completed in April 1962, it was the factory Targa Florio training car for Mauro Forghieri and Phil Hill. The 1st owner Edoardo Lualdi Gabardi, won many Italian hillclimbs and the Italian Champion in it's class. Gianni Bulgari bought the GTO in 1963 and finished in the same year the Targa Florio as class winner and 4th OA together with Maurizio Grana. The car changed ownership in December 1963 to Corrado Ferlaino and bodywork. It was rebodied by factory with '64 body style without roof spoiler. In 1964 it won it's class again in the Targa Florio and finished 5th OA with Luigi Taramazzo as Co-Pilot. 3445GT was completed on April 30th in 1962, it was first raced by Sergio Bettoja in the Parma-Poggio Hillclimb to a 3rd in class. Then it was owned by Count Giovanni Volpi di Misurata and started in Le Mans (dnf) with Nino Vacarella and Giorgio Scarlatti,Carlo Maria Abate won theTrophée Auvergne in Charade, the GTO had an accident in the Tour de France, finished 22nd OA in the 1000km Montlhery race and 5th OA in the 12h Sebring race, Ulf Norinder became the new owner and raced the GTO in Swedish colors, it finished 6th OA in the Targa Florio with Ludovico Scarlatti and J.M. Bordeu, in 1965 3445GT was rebodied by Drogo - in a non GTO like style, in 1976 it was damaged in accident and rebodied as Series 1 GTO. 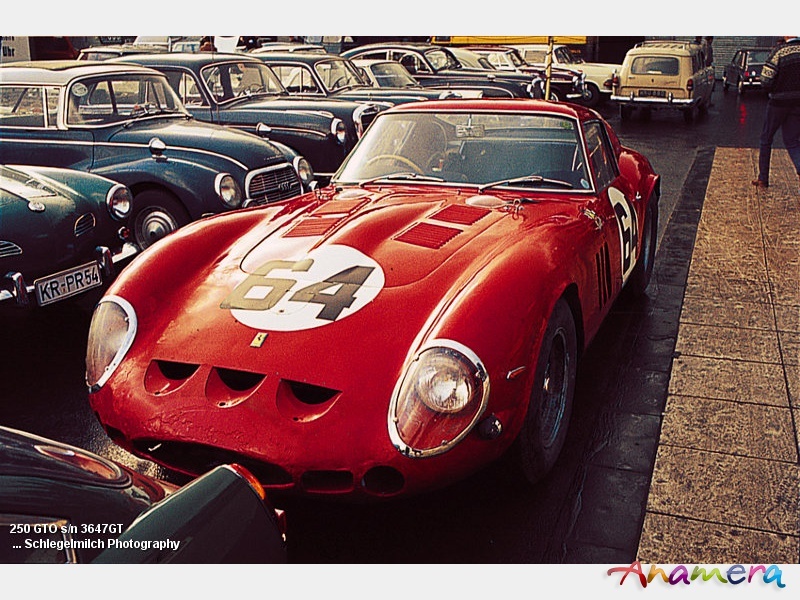 3451GT was delivered to Pietro Ferraro on April 20th 1962,he achieved with Ludovico Scarlatti a class win in the Targa Florio and finished 4th OA, the GTO had an accident during the 1000km Nuerburgring race, in May 1963 it was sold to Vincenzo Zanini and he landed in Coppa InterEuropa, Monza not in the ranks but on the roof, the GTO paused one year and in October 1965 appeared in the Coupes du Salon, Monthléry with Guy Rivillon, it participated in many French races, rallies and hillclimbs with success. 3505GT was delivered to Stirling Moss for UDT/Laystall it was delivered on April 20th, on April 8th Willy Mairesse was setting the fastest time during the Le Mans trials, on May 12th Masten Gregory finished 2nd OA in the International Trophy in Silverstone. Innes Ireland won the BRSCC in Brands Hatch. 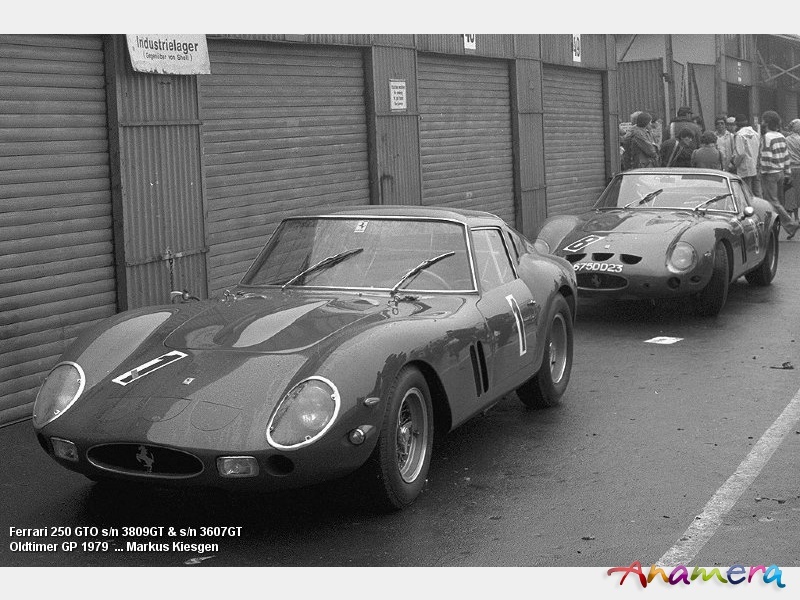 Innes Ireland and Masten Gregory shared the 250 GTO in Le Mans but did not finish. In August Innes finished 3rd OA in Brands Hatch and won the Tourist Trophy in Goodwood. In 1963 actor and race driver Dr. Gunther Plachetta / Gunther Philipp accuired the GTO, we won the Tirol GP, the Austria GP, Platsch Hill, Aspern, Austrian GP GT race in Zeltweg, and finished 2nd in Preis von Tirol in Innsbruck-Kranbitten and the Vienna GP. From 1973 till 1997 the Harrison Brothers owned 3505GT, next in the ownership list was Harry Leventis, Yoshiho Matsuda ($8.0mio) .. lately the GTO went on to Herema. 3527GT left the factory on May 22nd, it was delivered to Gottfried Koechert, he started with Umberto Maglioli at the 1000km Nuerburgring race (dnf), the GTO was sold back to the factory, and was sold to Lucien Bianchi via Ecurie Francorchamps, he finished with Claude Dubois 7th OA in the Tour de France, with Willy Mairesse he finished 5th OA in the 1000km Paris race in Montlhery , after the GP Angola the GTO wnet to the Scuderia Filipinetti, which sold it to Armand Boller. In many races he finished 1st. The GTO went to Bamford, VW dealer Don Nelson, car class tycon Stephen Pilkington, he kept the GTO for 20 years, in 2005 it was sold to Irvine Laidlaw. 3589GT was sold to Tommy Sopwith' Equipe Endeavour, Brighton via Maranello Concessionaires Ltd., Mcheal Parkes raced the GTO with great success. In November 1962 teh car went on to Tom O'Connor's Rosebud Racing Team, Victoria, TX. Innes Ireland raced the GTO in Nassau and in the 3h Daytona Continental and in the 12h Sebring race where it finished 6th OA and 3rd in class. 3607GT left the factory on 6th of June 1962 to it's first owner Ferdinando Pagliarini. It was raced in hillclimbs and circuit racing in Italy and achived class victories in, Fornovo-Cassio Hillclimb, Parma Poggio di Berceto Hillclimb, Coppa Acqua Cerelia, Predappio-Rocca delle Caminate hillclimb. In 1963 it was sold to Ecurie Francorchamps and was entered in the Tour de France driven by Claude Dubois andPhilippe de Montaigu to 8th OA and 3rd in class, it finished 5th OA with Peixinho in the Angolan GP. In 1965 it was sold to Philippe de Montaigu & Annie Soisbault de Montaigu. It was raced by Annie Soisbault de Montaigu and finished 1st in the GT class in the GP Paris, mid 1965 it was sold to Jean-Michel Giorgi, he raced it in 1965 and 1966 in French events, next owners were Pierre Bardinon of Aubusson and Jess G. Pourret. 3647GT left the factory on June 6th 1962 and was delivered to Col. Ronnie Hoare/Bowmaker, it was raced by John Surtees, in Mallory Park (3rd), Scott Brown Memorial Trophy, Snetterton (3rd), Peco Trophy, Brands Hatch (4th), Tourist Trophy, Goodwood (dnf) and the 1000km de Paris, Montlhery /2nd OA), in Spetember 1962 it was sold to Prince Zourab Tchkotoua, the Prince raced together with Hitchcock wre required. In 1964 the GTO was sold to Italy and raced by Sergio Marchesi, it won the Coppa Asiago, Ascoli-San Marco hillclimb, Guarcino-Campocatino hillclimb and the Aosta-Pila hillclimb. 3705GT left the factory on June 14th 1962 and was delivered to Jean Guichet. It was raced in 24h Le Mans and finished 2nd OA and 1st in class, 6h Auvergne, Charade (4th OA, 3rd IC), it failed to finish the Tour de France, biut was on the podium again in Criterium Cevennes (2nd OA, 1st GT), Stallavena-Boscochiesanuova (5th OA, 3rd GT), Col Bayard (2nd OA, 1st GT). In 1963 it was sold to Scuderia San Marco/Egidio Nicolosi and in 1965 to Cox Kocher, during this time nearly every weekend top finishes were achivied. 3729GT left the factory on July 28th 1962, it was delivered to John Coombs. It was raced in 1962 at Brands Hatch (2nd OA) by Roy Salvadori, Goodwood (2nd OA) by Graham Hill, in 1963 in Silverstone (acc) Mike Parkes, Whitsun Trophy Goodwood (2nd OA) Mike McDowell, Mallory Park (6th OA) Michael Salmon, British GP Silverstone (10th OA)Mike McDowell, Brands Hatch (5th OA) Jack Sears, Goodwood, Tourist Trophy (2nd OA) Mike Parkes, Snetterton (4th OA) Jack Sears, in 1964 in Castle Combe Race (2nd OA) Eddie Portman, Tourist Trophy, Goodwood (9th OA) Richie Ginther. 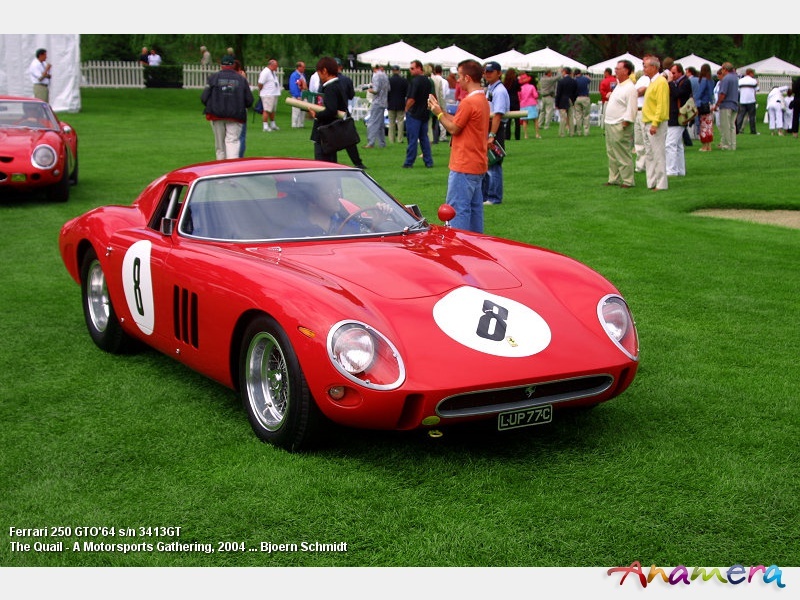 The GTO was bought in 1970 by Jack Sears a driver who raced it in 1963, he kept the GTO for nearly 30 years. 3757GT left the factory in June 1962 and was sold to Jacques Swaters for Ecurie Francorchamps, it finsihed the 24h LeMans 3rd OA, as well as the Tour de France. It has an impressive race history in 1962, 63 and 64 but after the 2000km Daytona race in which it finished 7th OA, it was worn out and collected mainly dnf's. The GTO is since 1978 a part of the Nick Mason collection. 3767GT left the factory on July 26th in 1962, it was delivered to David Piper it was raced by David Piper in 1962 and '63 .... it finished 1st in the 9h Kyalami race. In 1963 it was sold to the US to Ed Cantrell and it kept on racing till the end of 1964. 3769GT left the factory on June 13th, it was sold to Fernand Tavano, Le Mans, F, he entered the GTO in the 24h Le Mans race but dnf, there after the car won many many minor races, hill climbs and rallies. Since 1994 the car is part to the worlds largest Ferrari collection. 3809GT left the factory on July 9th and was sold to Kalman von Czazy, CH, it won 5 races but was rolled twice, there after it was sold to Swiss Pierre Sudan an since 1976 it belongs to a German Ferrari Collector. 3851GT was delivered to Jo Schlesser on September 11th, he finished the Tour de France 2nd OA, the GTO was involved in a very bad crash and was t-boned, it was send back to the factoyr for rebuilt and was sold to Paolo Colombo, he raced it in 1963 with great success, like Ernesto Prinoth in 1964 and 1965. In 1965 the GTO was sold to Fabrizio Violati. 3869GT left the factory in October 8th 1962, painted red with Oxford blue nose, it was delivered to Col. Ronnie Hoare/Maranello Concessionaires, UK, it was the London Motor Show Car, in 1963 Ron Fry became the new owner, he won many hillclimbs and sprint races. In December 1964 Karl Richardson bought the GTO and raced it in 1965 at Mont Ventoux hillclimb (3rd IC), Ollon-Villars hillclimb (4th IC) and at the Brighton & Hove MC Brighton Speed Trials (3rd IC). 3909GT left the factory on September 10th 1962 it was painted Grigio metallizzato. 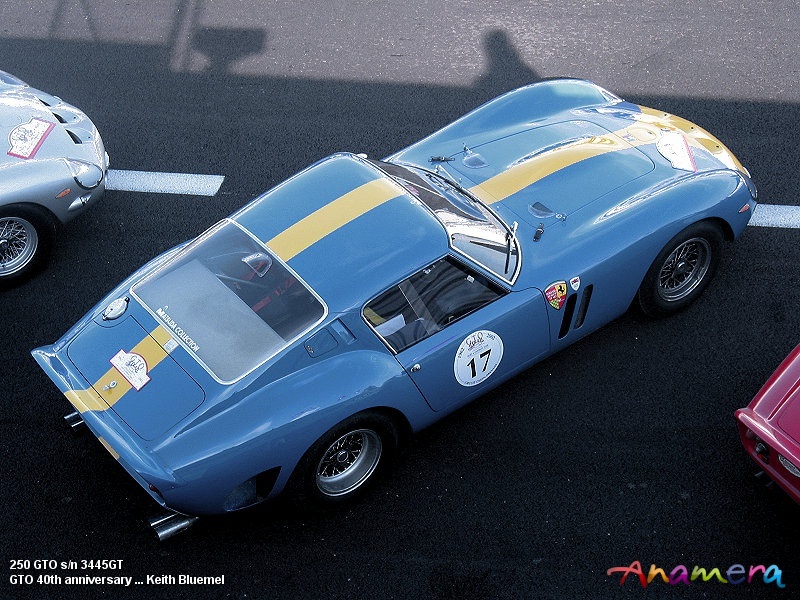 The first owner was Edgar Berney, the GTO was entered in the the 1962 Tour de France (dnf, differential), Coupe du Salon Montlhery (1st IC), 1000 km Paris Montlhery (dnf, engine), swiss racing legend Jo Siffert raced the GTO in the 500km Spa race and finished 3rd OA, One week later Heini Walter and Herbert Mueller raced together the 1000km Nuerburgring race (dnf, engine) the GTO was painted red with a white stripe. In 1963 3909GT was sold to Claude Bourillot, he raced mainly hillclimbs and rallies, in 1964 Claude Bourillot and Prince Michel de Bourbon Parme finished the Targa Florio 10th OA and 3rd IC, In 1966 Andre Aknin became the new owner and he achieved a couple of good results in hillclimbs. 3943GT left the factory on October 16th 1962 and was delivered to Pierre Noblet, it was raced in 1000km Paris, Montlhery (4th OA), 6h Dakar (1st OA), 500km Spa (2nd OA), 1000km Nuerburgring (2nd OA), 12h Reims (4th OA), in 1965 the GTO was sold to Robert Neyret, he raced mainly hillclimbs and rallies. 3987GT left the factory on October 11th 1962 and was delivered to N.A.R.T. it was raced by Pedro and Ricardo Rodriguez to victory in 1000km Paris, Montlhery, therafter is was sold to the Mecom Racing Team of Houston, TX, USA. Roger Penske raced the GTO during the Nassau Speed Week and won 3 races, he finshed 2nd OA in the 3h Daytona Continental, in the the 12h Sebring race he was 4th OA, won Pensacola, was 8th OA and 2nd IC in the 500 Road America race. Richie Ginther raced twice in Riverside and finished 5th OA. 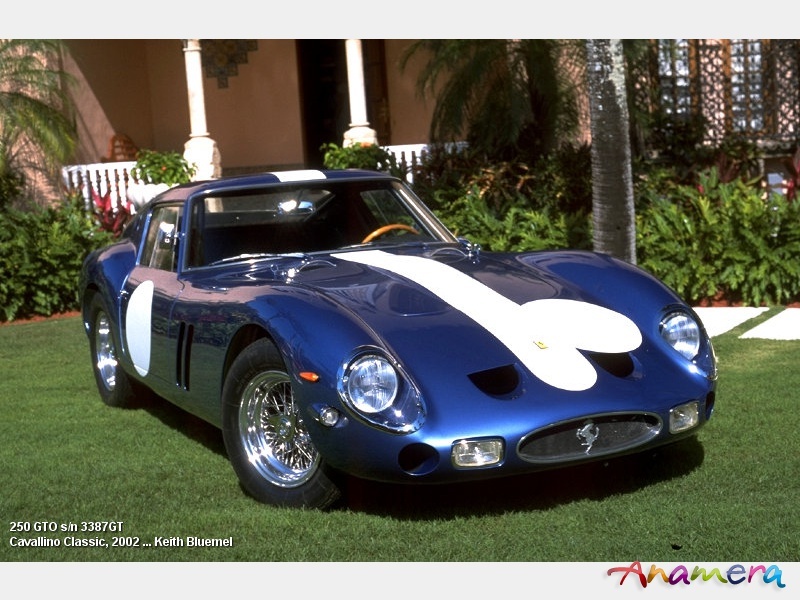 The GTO is today a part of the well known Ralph Lauren collection. 4091GT left the factory on November 17th 1962 as a '62 Series I GTO, it was delivered to Sergio Bettoja - Compagnia Romagna Albergi of Roma. 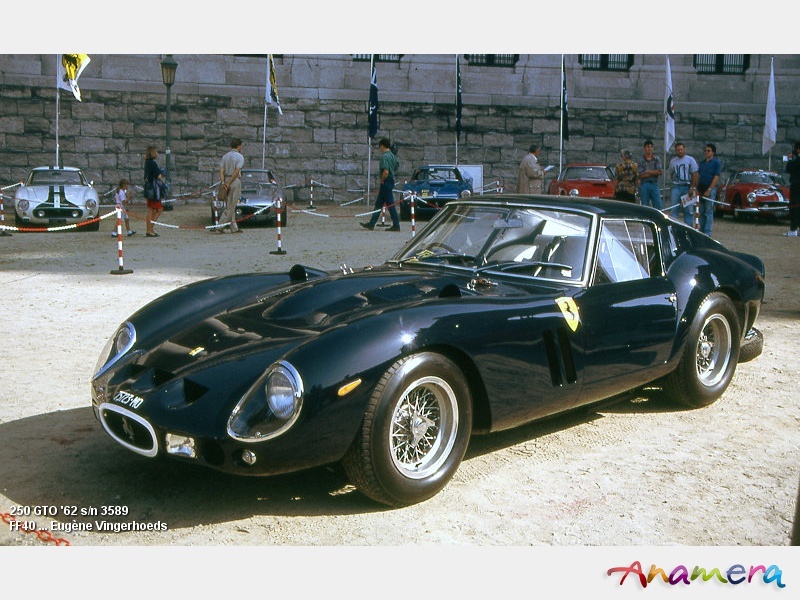 At the end 1963 the GTO received a '64 style body and was sold to Scuderia San Ambroeus, Italy. 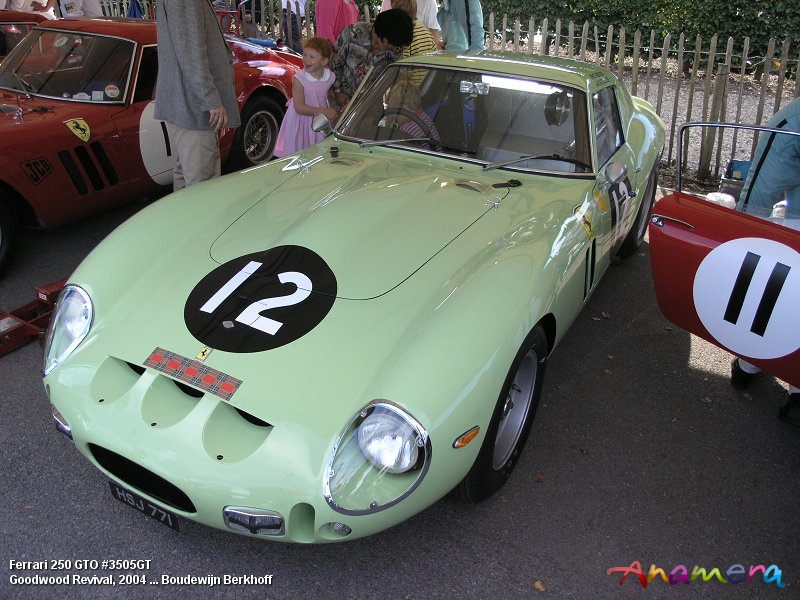 Edoardo Lualdi Gabardi traced the GTO in hillclimb of which he won 6 OA. On January 1965 Clemente Ravetto of Palermo bought the GTO for 2.0mio Lire, he raced 4091GT in Coppa Gallenga hillclimb (3rd IC), Messina-Colle San Rizzo hillclimb (2nd OA), Targa Florio (1st GT), Monte Pellegrino hillclimb (3rd OA), Coppa Sila hillclimb (4th OA), Sestriere hillclimb (1st IC), Coppa Citta d'Enna (6th OA) and Coppa Nissena hillclimb (1st OA). 4153GT was completed on June 2nd 1963 and delivered to Pierre Dumay, who raced together Leon Dernier in Le Mans and finished the 24h races 4th OA and 2nd IC, it was sold to Ecurie Francorchamps and in 1964 to Marquis Philippe de Montaigu it was driven by Gerard Langlois van Ophem, Gustave Gosselin, Francis van Lysbeth, Lucien Bianchi, Georges Berger, de Montaigu, Willy Mairesse, Gauvin, Lambrecht, Grant, Ligier, Jean Blaton. Lucien Bianchi and Georges Berger won the 1964 Tour de France. 4219GT was completed on Febuary 5th 1963 and was sold to Mamie Reynolds via Luigi Chinetti Motors of Greenwich. Pedro Rodriguez won the 3h Daytonay Continental, Bonnier and Cannon finished the 12 h Sebring race 13th OA and 4th IC, the GTO was passed on to beverly Spencer and was driven by Frank Crane. 4293GT was completed on April 22nd 1963 and was sold to Jacques Swaters, it won the 500km Spa with Willy Mairesse and finsished 2nd OA in the 24h Le Mans race with "Beurlys" and Gerard Langlois van Ophem. 4399GT was completed on May 29th 1963 was left the factory with a Series I style bodywork and was delivered to Col. Ronnie Hoare. Mike Parkes won the Whitsun Trophy, Goodwood, Martini Trophy, Silverstone and the Tourist Trophy, Goodwood. At the end of 1963 4399GT received a '64 style Scaglietti body, Graham Hill won the Sussex Trophy, Silverstone and the International Trophy, Silverstone, Mike Parkes won the 500km Spa, Innes Ireland and Maggs finished the 24h Le Mans 6th OA. In 1965 it was sold to Gordon Durham, UK in that year it was raced by Mike Salmon. 4491GT was completed on June 7th 1963 and delivered to David Piper in Reims (dnf), Trophées Auvergne, Charade (9th OA, 3rd IC), Grovewood Trophy, Mallory Park (5th OA), British GP GT race, Silverstone (2nd OA), Guards Trophy, Brands Hatch (7th OA, 3rd IC), Tourist Trophy, Goodwood(5th OA, 3rd IC), Coppa Inter Europa, Monza (4th OA, 2nd IC), Canadian GP GT race, Mosport (10th OA), 9h Kyalami (1st OA), 2000km Daytona Continental (2nd OA), Sussex Trophy, Goodwood (3rd OA), International Trophy, Silverstone (4th OA), 500km Spa (5th OA), 1000km Nuerburgring (4th OA), 12h Reims (4th OA), Ilford Film Trophy, Brands Hatch (4th OA), Tourist Trophy, Goodwood (10th OA), Canadian GP GT race, Mosport (5th OA), 1000km Paris, Monthléry (4th OA), Rand 9h, Kyalami (2nd OA), Angola GP, Luanda (6th OA). In 1965 the GTO was sold to Peter Sutcliffe and went back in 1974 to David Piper. 4675GT was completed on May 23rd 1963 and delivered to P. Annunziata. Guido Fossati raced the '62 style GTO in Italian Hillclimbs in which he always finished 2nd. In September 1963 he bought the GTO together with Ariberto Francolini, they shared the drive in the Tour de France and had an accident. At the end of 1963 it was rebodied '64 style. In 1964 it was raced by Scuderia Elmo d'Argento, in the Targa Florio and driven by Jean Guichet and Carlo Facetti (dnf) and in the 500km Spa race (2nd OA). Then the GTO went on to Oddone Sigala, he raced it the entire '64 season, in Mugello (3rd OA), Trieste-Opicina hillclimb (6th OA), Trofeo Val Camonica (2nd OA), Coppa Inter Europa, Monza (5th OA), Trofeo Lumezzane hillclimb (4th OA), 1000km Paris, Monthlery (12th OA), Trofeo Bettoja, Monza (3rd OA). The next owner was Vincenzo Nember and raced it with great success, he acchived many over all and class wins. At the end of 1965 Luigi Taramazzo bought the GTO finished the Rally Palermo - Trieste in 2nd position. 4713GT was completed on June 5th 1963 with LMB body style, it was delivered to Luigi Chinetti of Greenwich (CT, USA). David Piper and Masetn Gregory finished 6th OA (4rd IC) in Le Mans, Roger Penske 8th OA in the Tourist Trophy, Goodwood, Schlesser and Le Guezec raced it in the Tour de France. Bob Grossman of Nyack became the new owner, he raced the GTO in 2000km Daytona Continental (3rd OA), 12h Sebring (15th OA), Virgina Raceway (4th OA), Bridgehampton (1st OA and 2nd OA), Mosport (10th OA) and Thompson (3rd OA). 4757GT was completed on June 5th 1963 and delivered to Scuderia SSS Repubblica di Venezia, in Le Mans Carlo Maria Abate and Fernado Tavano dnf due to an accident, in the Trophée d'Auvergne, Charade Carlo Abate finished 3rd OA, Cesana-Sestriere hillclimb 8th OA, Freiburg-Schauinsland hillclimb 11th and in Ollons-Villars hillclimb 9th OA but always winning it's class. Fernand Tavano and Lorenzo Bandini dnf the Tour de France. In 1964 the GTO was raced by Boulanger. 5095GT was completed on September 6th 1963 and delivered to Scuderia SSS Repubblica di Venezia, Carlo Maria Abate and Lucien Bianchi finished 2nd OA in the Tour de France. Then the car was sold to Fernand Tavano of Le Mans he raced it 1964 in France.